I hope you enjoy trying my Fix-It Sentences!! Be sure to check out the YEARLONG BUNDLE to make sentence editing a part of your writing routing! Little writers will love to find common mistakes (inspired by real writers in my classroom). These are great for whole groups, small groups, writing centers, morning warm-ups, shared writing, writers workshop mini lessons, meaningful sub plans, and more! 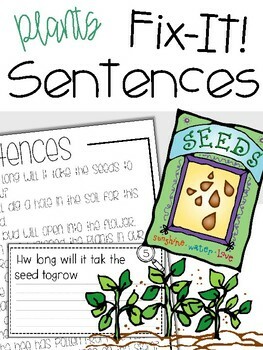 Each set has 10 sentences and is great for a week of editing fun! Anchor charts for what makes a good sentence. In the printed version, there are 2 sentences per student page. Read the sentences as they should be written and give the students time to find the errors. Come together to discuss the mistakes they found. Then students write the sentences correctly. *This is just a suggestion... Make them work for you! FIX-IT SENTENCES YEARLONG BUNDLE contains this and other sentences to fix... find the THEMES or the SKILLS you'd like to work on! Plus, a NO PREP option with PowerPoint and white boards makes for quick, meaningful lessons!